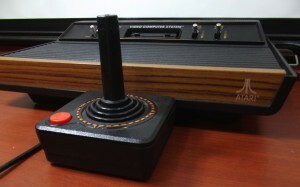 Our first video games console. I remember the wood effect. 2) “You start by exploring the world with curiosity and begin to develop a hypothesis of what you’re supposed to do. Through trial, error, pattern recognition, logic and chance you continually reformulate your trajectory.” Agree. These two sentences, for me, encompass the development of a child. Technology-wise, as part of the generation brought up on the Atari (hardly any buttons, wood effect, joysticks, that’s all I remember), Sinclair ZX Spectrum, Sega Megadrive, GameBoy, SNES, etc, (most owned by my brother) all we did, for years and years was try, fail, try, fail, think a bit, try again, fail, try again, fail, sleep, try again, win – sometimes! 4) When writing about his school’s training programme for their new iPad 1:1 programme, “I’ve noticed that sessions that put a premium on play were not only more effective at cultivating the targeted skills, but also encouraged a growth mindset.” When you get people to enjoy things you can teach them anything. In my experience people are crying out for an excuse to relax, let go and just embrace technology in a safe, doesn’t matter if you make a mistake, atmosphere. 5) “The best way to prepare for the emergence of the future is to learn how to be comfortable with uncertainty. To be comfortable with uncertainty, one must remain fluid, receptive and creative — in a word: playful.” To me, it all makes complete sense! Just play and see what happens. What is the worst that could happen? (I live by this philosophy quite a lot…) Especially a video game? You lose. That’s it. Don’t be scared of making a mistake; in video games and in life. You may have been burned in the past, but that’s the past. It doesn’t matter. Brilliant thing is, with play and technology you get to try again as many times as you want. And with all the hours of practice you put in trying again, you get better. By making mistakes, and knowing that that’s ok, not just ok, but necessary!, you learn the key skills of resilience, perseverance, and general bouncebackability! So thank you, Aran, for writing this article and pointing me to lots of resources that have already helped further my understanding of this whole thing. You have made me even more determined to keep exciting curiosity!